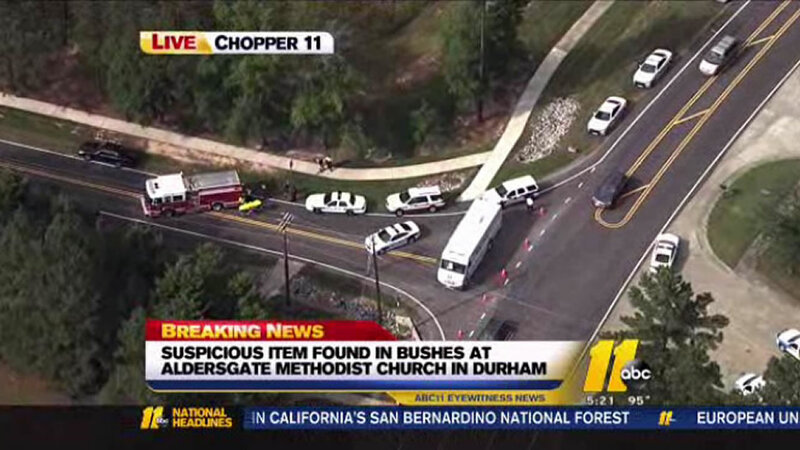 DURHAM COUNTY, N.C. (WTVD) -- Authorities in Durham County responded to reports of a suspicious package Monday afternoon. It happened at the Aldersgate United Methodist Church, which is off of Umstead Road just west of Guess Road. An object seen thrown into the bushes turned out to be a woman's purse. A witness told the minister there that they saw someone pull up in a car, throw the purse in the bushes, and then they left the scene. The bomb squad was called in as a precaution.